For a human picture of what life is like in Russia, as reported by a good observer and a perceptive photographer, A Russian Journal will help Americans know the Russians as people like themselves. 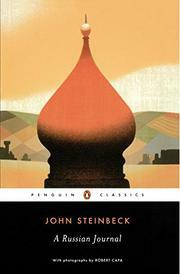 Steinbeck has the gift of seeing and sharing what he sees. This is a very simple, straightforward book, without political implications. It is a personal experience book, with some of the hardships and problems but with almost nothing of censorship, except as indirectly applied by difficulties sometimes put in the way. They went, in the main, where they wanted to go; saw the things they wanted to see; talked to the people -- rather than the mouthpieces of government. They liked the Russians- they ate and drank too much- they saw the ravages of war and were convinced the Russians wanted peace. The text of the book is about double the text that appeared in syndicated columns, but the deletions were for space not policy.